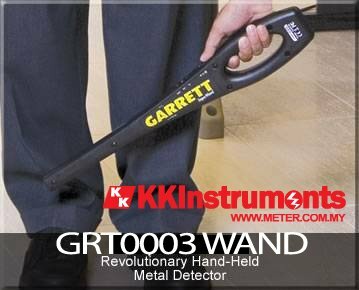 The GRT0003’s exclusive 3600 Plus detection field provides uniform sensitivity 3600 along the scan area and pinpointing at the tip--all to detect weapons and other metal objects with extreme accuracy. Current user: Grand Paragon Hotel, Johor Bahru. 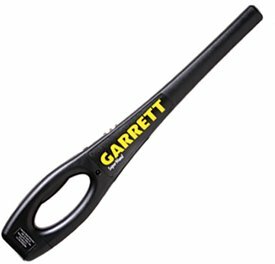 What’s more, the GRT0003 is very easy and fun to use. Just push the one-touch button, and the red, green and amber LED lights provide you with instant operating-mode information. Its ergonomic grip and sleek dimensions make handling comfortable and less tiring, even for long hours of scanning. The GRT0003 lets you choose a clear audible or silent vibrate/LED alarm signal where detection needs to be less conspicuous. And it provides optimum sensitivity with automatic retuning, while requiring absolutely no adjusting. The GRT0003’s rugged injection molded construction features a structurally separate coil for increased impact absorption. The detector includes a convenient 9 volt battery. Accessories optionally available with the GRT0003 include a choice of 110 volt and 220 volt recharge kits with batteries and a belt holster. Plus provides uniform sensitivity along the scan area including tip pinpointing. Choice of audible or silent vibrate/LED alarm, for less conspicuous detecting. *Perfect to be used in hotels.